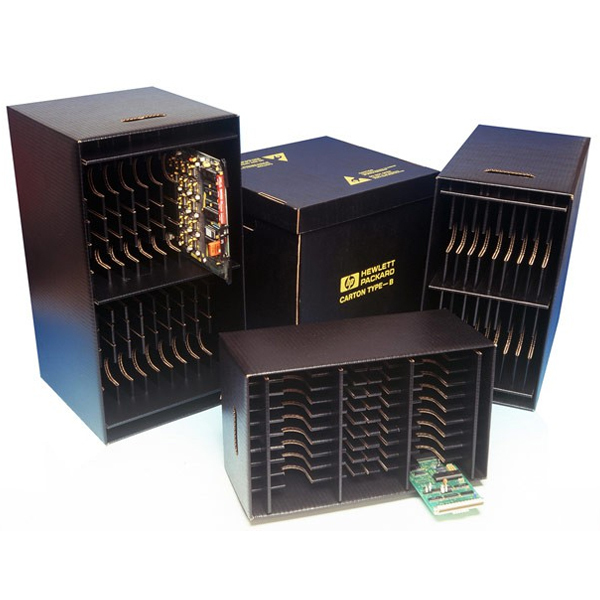 These Collapsible Tote Divisions are manufactured from conductive corriplast, making them both robust and ESD safe. With slots at 30mm increments, the divisions can be arranged to create a network of cells to suit your particular application without the need for tooling. Designed to fit the award winning collapsible tote boxes sized 600mm x 400mm and 400mm x 300mm in two standard heights. 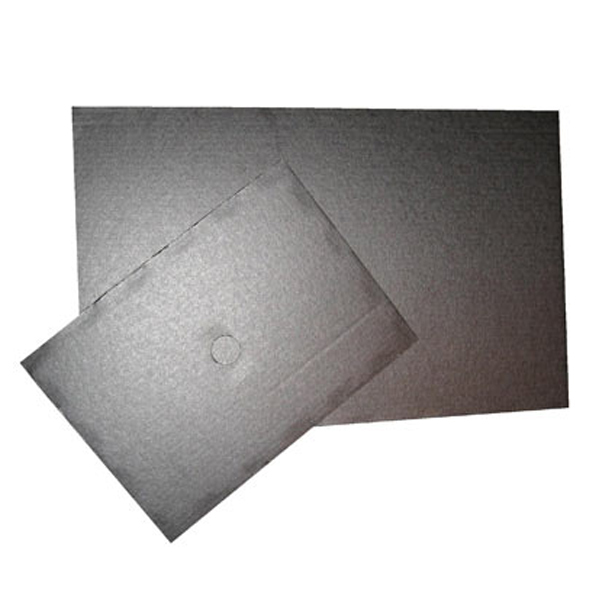 Manufactured from high performance conductive corriplast, these Layer Pads offer a flexible solution to creating rigid layer separations within stacking totes. Available as standard in two stock sizes to fit totes, although custom sizes are available on request. An ESD safe solution that is also perfect from cleanroom environments where static protection is a requirement. 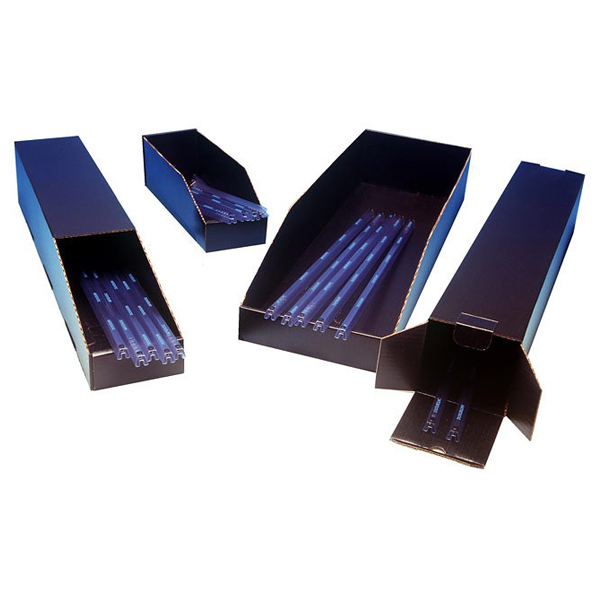 The Slotted Tote Divisions are manufactured from 3mm corriplast conductive fluted polypropylene, offering an ideal solution for creating a network of smaller cells in standard plastic totes. With slots at 30mm increments, the cells can be sized to suit, offering a neat and safe method of storing multiple components or parts in one outer container. Robust, ESD safe and suitable for use in clean environments. These Corstat Bin Boxes are made from conductive fibreboard, giving static shielding and physical protection to its contents. Available in a wide range of sizes, plus available as closed, open front and fully open variants, there is sure to be a solution to meet your needs and application. 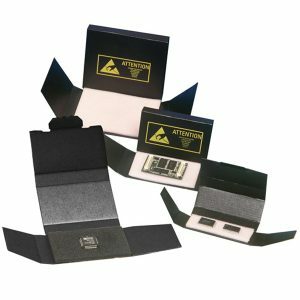 These Chip Boxes are manufactured from Corstat conductive corrugated fibreboard, providing an ESD safe and cost-effective method of shipping chips and small electronic devices. Available as flat pack in a variety of sizes, the boxes can also be provided with soft antistatic foam or high density pin stick grade conductive foam to meet your requirements. 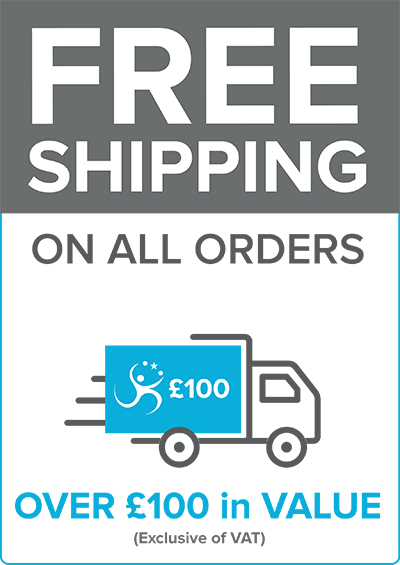 Available from stock for next day delivery. This Collapsible Tote Bin offers a perfect solution where space is an issue for storage or cost-effective return shipping. Manufactured from conductive corriplast, the collapsible tote is lightweight, robust and ESD safe method of storage. Available in a variety of sizes, with or without lids. 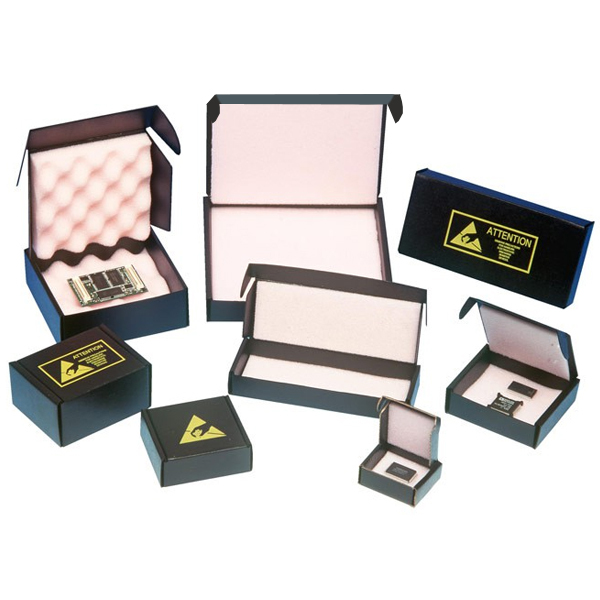 The Corstat range of Component Boxes offer a convenient and safe way to store and transport static sensitive devices. The Corstat conductive coating provides Faraday cage protection and the antistatic foam insert provides ESD safe cushioning to protect the box contents. Available from stock in a range of sizes. 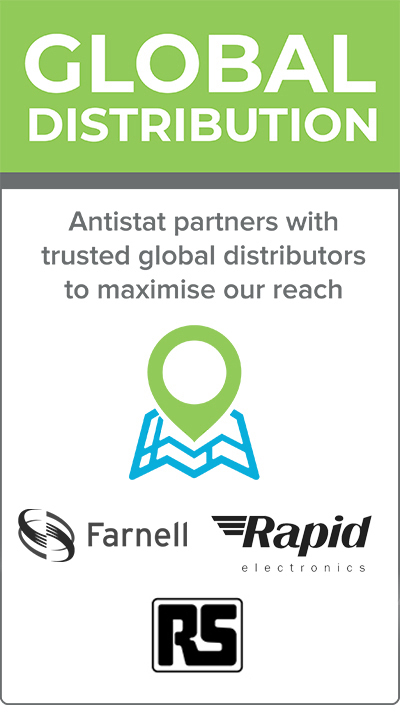 These conductive fibreboard Corstat Inplant Handlers provide a flexible, fully adjustable, anti static system to safely house boards. With adjustable partitions you can easily create the desired cell size to accommodate nearly any board size. Fully adjustable and available in a variety of sizes, order yours from stock today. 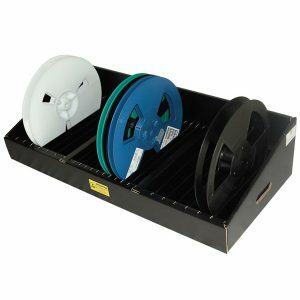 Catering for 7″ and 15″ reels, the Corstat Reel Storage System provides a robust bench mount storage system. 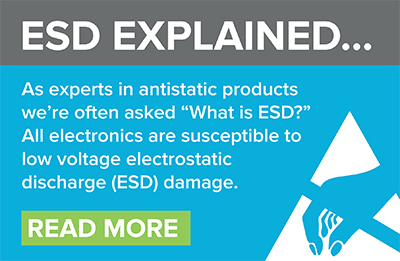 With high levels of ESD protection, this product is available in Corstat coated corrugated fibreboard, or as conductive Corriplast making it suitable for cleanroom use or heavy wear environments. Available in single, double and triple module units, with division spacing of 18mm or 32mm to suit your application. Manufactured from Corstat conductive fibreboard, these Stacking Tote Divisions offer a durable and fully ESD safe method for dividing Corstat stacking totes. The divisions can be arranged in to different formations to form a cell structure which suits your specific applications or storage requirements. In addition to the standard range, bespoke sizes are available. Get in touch to find out more. These Stacking Tote Lids are designed to fit the Corstat range of stacking tote boxes. Constructed from the same conductive fibreboard as the tote boxes, the lids complete the storage solution, ensuring the contents are well protected, safe from the risk of an ESD event, and that the boxes themselves can be safely stocked with no risk of damage to the contents. Order these together with the totes for a complete storage solution. Corstat Stacking Tote Boxes are manufactured from conductive fibreboard and are available from stock, in a range of sizes. These totes are a durable yet lightweight solution for inplant component handling and storage where ESD safety is a consideration. A viable alternative to injection moulded products. Please note that lids and divisions are sold separately.